For all of us who love enjoying the snow and festive activities from INSIDE the house. 1. A cozy (and very cute!) pajama jumpsuit you should probably just pack your bags and move in to. Get it on sale from Aerie for $45.46 (originally $64.95; available in sizes XXS-XXL and two prints). 2. Crew socks because if you're going to be glued to the couch all winter, you need some good socks to keep your feet oh-so toasty. Get it from Amazon for $11.99 (available in 16 prints). 3. And given that you can never own TOO many socks, a velvet pair so luxurious you have to wear them under everything (including other socks). Get them from Free People for $14 (available in five colors; plus a 5 for $30 special!). 4. A doormat with very clear instructions for your guests because you sure as heck aren't going out in the cold. Get it from The Cotton Mill Shop on Etsy for $40. 5. Speaking of peppermint, a flavored syrup so you can get your peppermint mocha fix without having to drag your cold booty out into the real world. Promising review: "Oh my goodness — the flavor of a Starbucks' white chocolate peppermint mocha right here at home now, and without the great increase in costs! Lots of punch of flavor from even one pump of this syrup." —Brian S.
6. 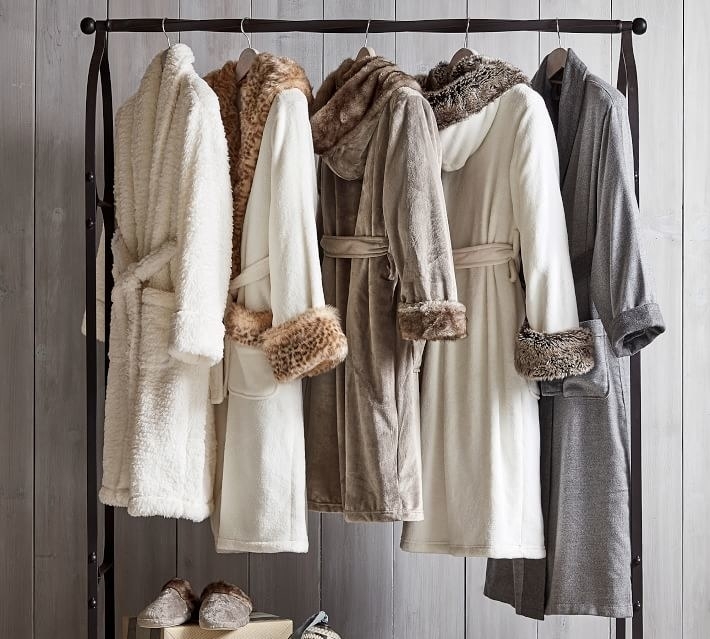 A super fluffy, faux-fur robe that — not to be dramatic — I would never take off; like I am pretty sure I would die in this. 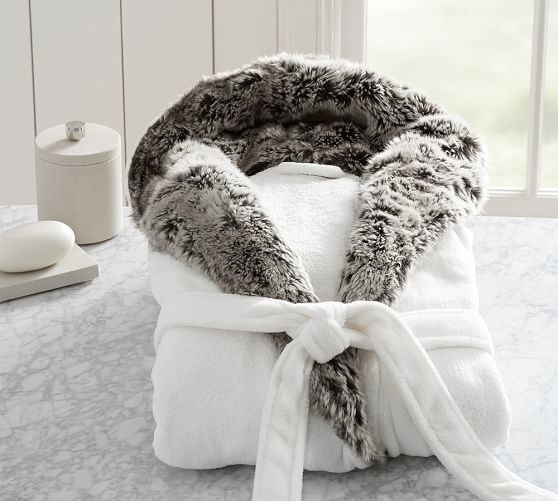 Get it from Pottery Barn for $129 (available in sizes S-XL) and see their other robes here, or get something similar from Amazon for $49.99. 7. 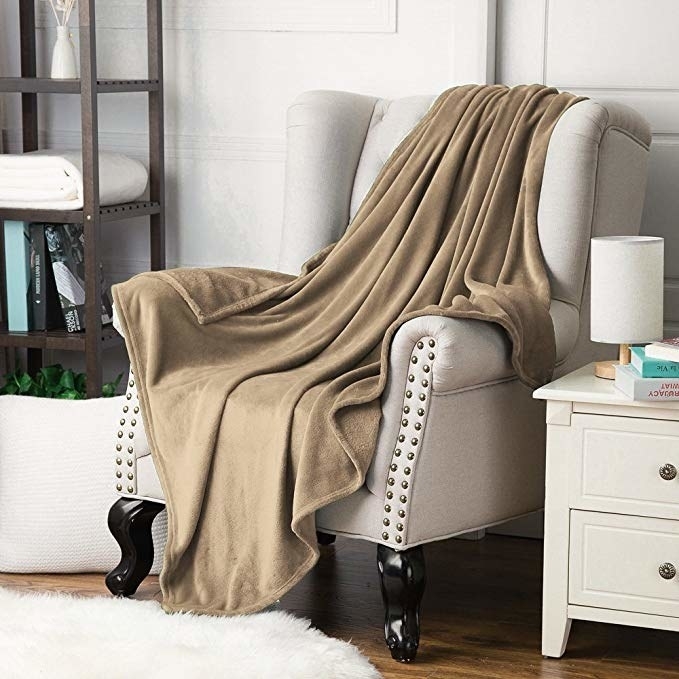 A super chunky wool-knit blanket that'll make the most impressive bed fort you've ever seen. Get it from Amazon for $25.88+ (available in 11 sizes and colors). 8. A gorgeous slate cheeseboard and cutlery set, because if you're going to any parties, it'll be the one you throw at your house. Get it from Amazon for $25.97+ (available in two sizes). 9. An Instant Pot cookbook packed with foolproof recipes that'll deliver up some delicious food while teaching you how to use all the features on your magical appliance. Get it from Amazon for $14.02. And if you haven't gotten yourself an Instant Pot yet, get one for $72.07+. 10. A cocoa-ready mug that's practically begging you to make a deluxe hot chocolate and plop yourself on the couch for a Christmas movie marathon. Get it from Anthropologie for $10. 11. And! A weighted drink holder that'll grip onto your beverage so you literally don't have to move. Get it from The Grommet for $19.95 (available in four colors) or Amazon for $24.66 (available in five colors). 12. A bed tray, because who says you have to get out of the house to enjoy a good meal and a movie? Get it from Amazon for $39.86+ (available in three colors). 13. A book of the month club that delivers you exciting reads and fun little surprises...you should probably just cancel all your plans now. Get a three-month subscription from Book of the Month for $44.99+. 14. OR! 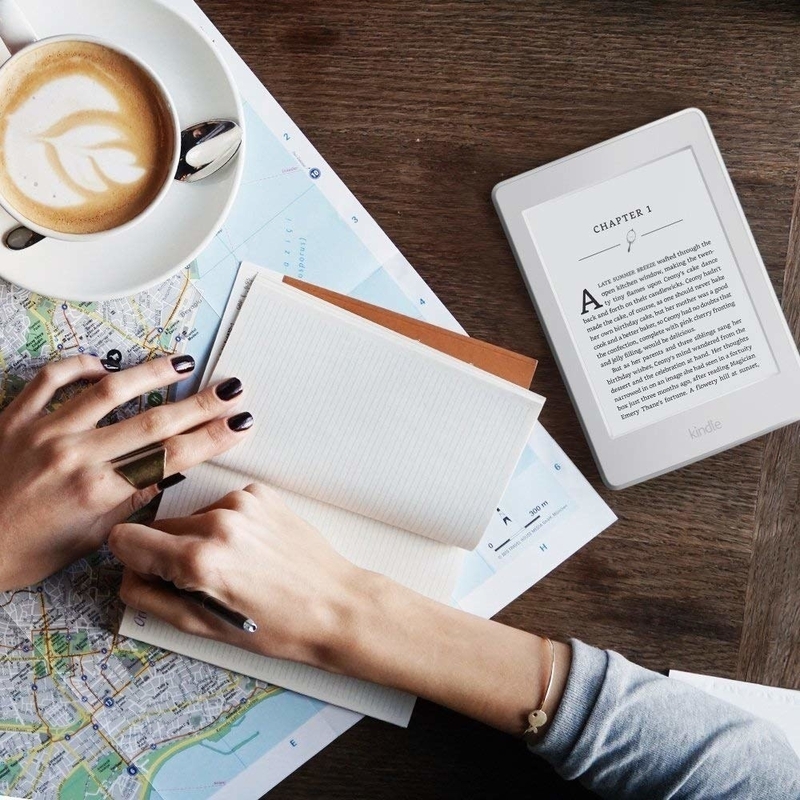 A *new* waterproof Kindle Paperwhite so you can curl up next the fireplace and read all your favorite books while time slowly disappears into the background. Before you know it, it's spring! I just hopped on the Kindle train and I am honestly angry with myself that I waited so long! Don't get me wrong, I still love physical books, but Kindles make it so easy to read anywhere at anytime — no lugging around bulky, heavy books anymore. Ever since I got my Kindle, I intentionally show up to dinners early just so I can sit at the bar and read! It fits in some of my smallest purses and provides instant entertainment while I am waiting in line, riding the subway, or just curled up on my couch. Now my only hobby is wrapping myself up in a blanket, parking myself in my living room, lighting a couple candles, and diving into whatever book it took two minutes to download on my Kindle. If you haven't yet, GET 👏 A 👏 KINDLE 👏! Get it from Amazon for $129 (available in black and white), and make sure to grab a case for it for $9.99+. 15. A matte black, stainless steel kettle I just want to stare at, it's so beautiful. But beyond looks, this has a stay-cool handle and trigger spout to meet all your tea needs. Get it from BuzzFeed's Goodful line, exclusively at Macy's for $56.99. 16. Plus, a tin of peppermint tea (we love peppermint in this household, ok?!) that'll soothe your unhappy stomach from all the food you'll be eating for the holidays. Good for the stomach, good for the soul. Get a 30-count tin from Amazon for $11.02. 17. A festive as h*ck sweater for your sweet angel pet so they can get into the holiday spirit with you — and because they need to keep warm, too. Get it from Amazon for $12.99 (available in six sizes and eight prints/styles). 18. A slouchy cardigan for easily layering over your onesies. 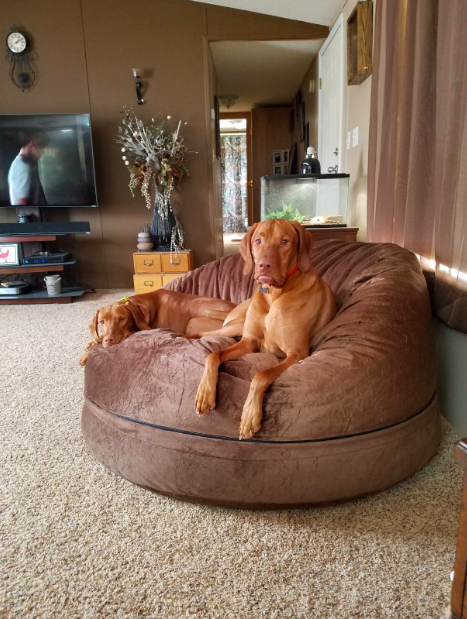 You're going to be so dang cozy this winter, I can't stand it. Promising review: "I was wary about buying a sweater online due to many bad experiences. After reading all of the reviews, I decided to give this one a try. This sweater is perfect size (slightly oversized but not TOO baggy). It is very soft and cozy. I LOVE this sweater and would encourage others to take the chance and buy this!!" —Erika G.
Get it from Amazon for $24.99+ (available in sizes S–4XL and two colors). 19. A string light curtain to make your room feel like a twinkly wonderland that you never want to leave. Promising review: "I’m so happy with these lights! It took a few minutes to get them unraveled, but using zip-ties to hang them made it quick and easy. My house feels so cozy now, just in time for the long winter season." —G.S. 20. Indoor fleece slippers that'll envelope your feet in warmth and cuteness and love — which, ya know, are the three pillars of winter. Get them from Amazon for $12.99+ (available in sizes 4-12 and 15 animal/color combinations). Get it from Amazon for $19.99+ (available in four sizes and 12 colors). 22. A vintage-style, Krampus soy candle for anyone who is still living for Halloween but ready for the holidays — the best combination of things, TBH. Get it from Kitsch Candle on Etsy for $12.95 (personalization optional). 23. A snowflake cake pan to properly honor the outdoors while you stay warm indoors. Many reviewers mentioned the paper can be too thin for certain markers, so if you're a newb (like me) it would be best to start with colored pencils. Get a 72-set for $24.99. Promising review: "This coloring book is absolutely stunning! A must have for all Disney and Thomas Kinkade fans alike! I live the colored paintings next to the line art. It gives inspiration if you're feeling a little overwhelmed with color choices. This is a really well put together coloring book!" —Jessica R.
Get it from Amazon for $11.43. 25. A hilarious and accurate The Grinch sweatshirt that will become your mandatory couch uniform — sorry, I don't make the rules. Get it from Femfetti on Etsy for $28.90+ (available in sizes S-2XL and three colors). 26. 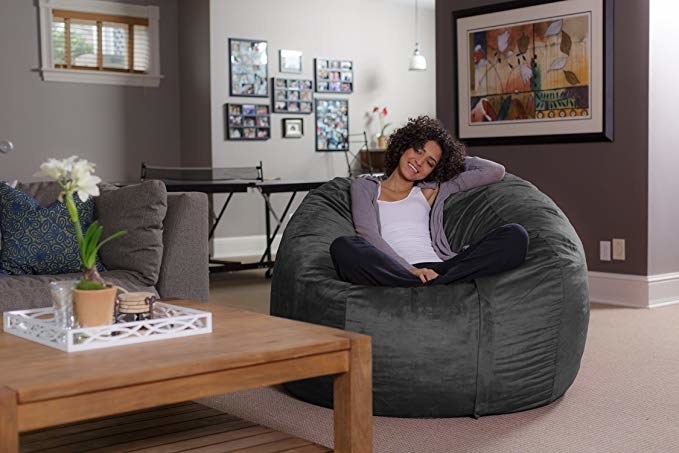 A giant, memory foam bean bag you'll want to IMMEDIATELY curl up in. Disclaimer: You just might have to fight your dogs for it. Get it from Amazon for $110.72+ (available in 15 colors and smaller size). 27. And since we're going all out here, a mega-plush rug to put under your new bean bag. 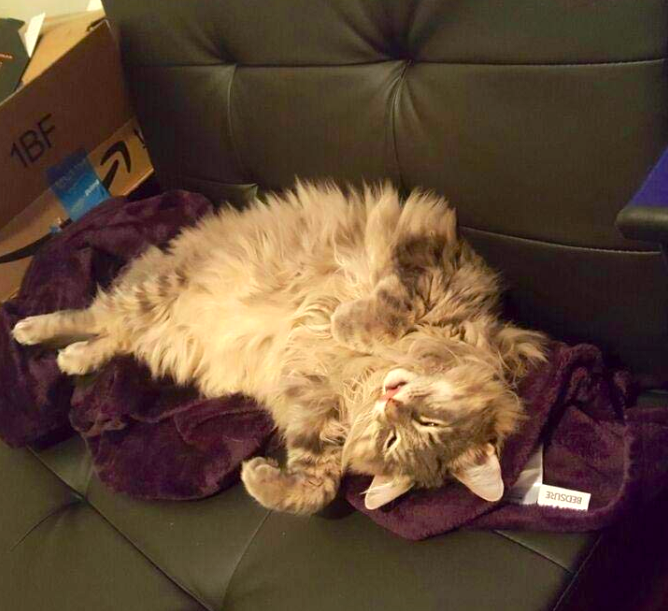 Comfort is the name of the game, people. These come in a TON of sizes and colors so you should have no problem finding one that'll perfectly fit your space. Also, I've owned rugs from this brand and can vouch that they have amazing, high-quality products. Get it from Amazon for $18.75+ (available in 24 size/shape combinations and eight colors). 28. And a silk pajama set because sometimes — even though you're hibernating in your house — you still want to feel fancy as hell. Get it from Amazon for $28.98 (available in sizes XS-3XL and four colors).